This is mv routine for the "Mental Photography Deck," or "Nudist Deck," as it is sometimes called. This routine has been in my working repertoire since 1969. I find the regular bridge size cards most suitable because they, and a deck of all blank cards, are easily accessible. Spread the cards between both hands. Separate the spread near the center, taking half the spread deck in each hand. Turn your hands over towards you and show both sides of the cards. Have a deck of Double-Blank, bridge size cards loose in your left side coat pocket. In the same pocket cany your Nudist Deck in its case. 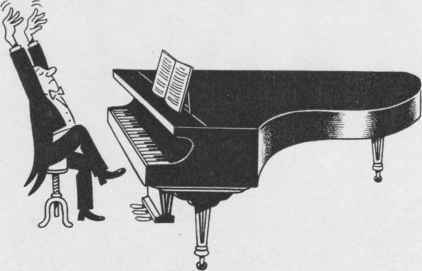 When you are ready to perform, remove the cased Nudist Deck from your pocket, remove the cards from their case, and place the empty card box in your right side coat pocket. Hold the deck "face up" in your left hand. That is, if the cards were separated, face up cards would show. I will give my patter, in the proper place, along with the correct handling. "I have an interesting pack of cards to show you. 1 believe what makes these interesting is the fact that they have no faces or backs. Thev are blank on both sides!" "Now you are probably wondering what I might do with a pack of cards that are blank on both sides. It I had you select one, I wouldn't know which one it was. I wouldn't know if it was face up or face down!" 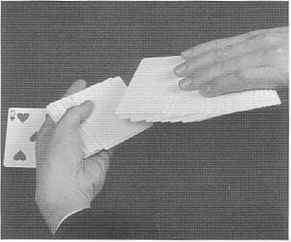 As you say the above three sentences, again perform the two hand spread and thumb fan sequence to show the backs and faces of the cards blank. "But let's pretend you did select a card. Let's say you took a card, like the Five of Hearts, for instance." Cut the pack by the ends, near the center and complete the cut. Name whichever card shows. In my example, it's the Five of Hearts. Place the card face-up on the table, and continue: "Of course that's easy to find because it's the only card in the pack." "Of course if we had other cards to get in the way, cards like a King, Nine or Three...we don't have those cards, but if we did, we would have to worry about which one you selected." As you say the above sentence, close up the cards and cut quickly to three different places in P the deck, revealing three different It cards. Name the values of these cards. o l0 Close up the pack immediately af ter showing the third card and quickly A spread the pack between your hands, showing the pack all blank, as in the beginning. In other words, spread four-fifths and show both sides of the cards in your right hand. "But suppose you wanted to play a little Poker, Gin Rummy or Bridge. Then yoti go to a store and pick up a regular pack of cards with faces and backs like this." Pick up the single card that is on the table and replace it on the face of the pack. Lift the pack by the ends with the right hand and dribble the cards back into the left hand. Stagger the dribble so that many face up cards will show. Place your left thumb tinder the pack and push upon the cards, turning the pack over in the left hand, showing many backs. 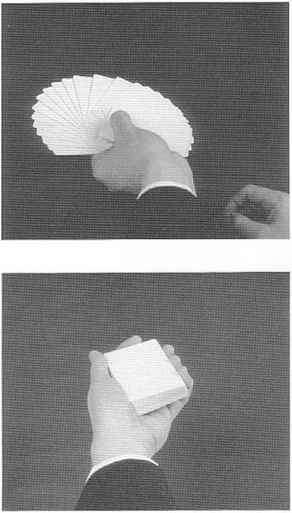 (See Photos 4 and 5) Flip the cards back face up, and square the pack with both hands. 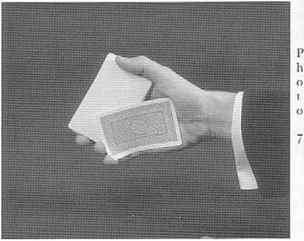 With the tip of the left forefinger at the back of the pack, push the back card to the right until it begins to pivot on the right little finger, then continue pushing with the left second and third fingers until the card is in the right palm. Immediately the left inner corner of the card is clear of the pack, the left little finger goes into the triangle formed to grip the pack. Photo 7 shows the view from underneath the pack. Remove die right hand momentarily to let the full face of the visible card be seen. Keep the left hand perfectly still, then bring the right hand across the pack from right to left, leaving the palmed card flush 011 the face of the pack as the hand travels. Pause a moment for effect. 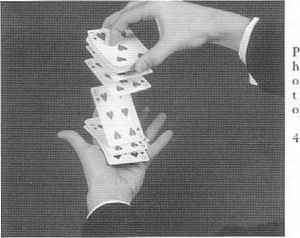 Now spread through the pack, applying pressure, and take half of the spread in each hand and tip vour hands over toward you, showing both sides of the cards. Holding the squared pack in your left hand, place both hands in your two side pockets. Your left hand switches packs as your right hand comes out with the card box. 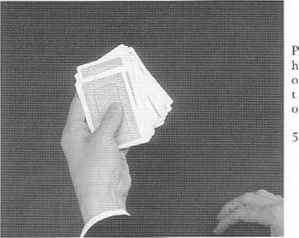 Your left hand comes out of the pocket with the regular blank deck and you start to put the cards away in the box. Pause, and change your mind. Put the empty box on the table, towards your left, and place the blank deck on top of the card case. 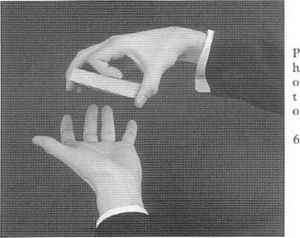 Immediately reach in your pocket for a prop for your next trick and begin that effect. Just ignore the blank deck on the table. Your spectator can hardly resist picking up the deck to examine it. If he does not pick up the deck, finish the effect that you are now performing. Now pick up the blank deck, put it in the box and put the cased deck away in your pocket. This routine has served me well for many, many years and I can vouch for its effectiveness.